The last instalment in Avenue of Allies series of Westcoast releases this month is a trio of albums from David Roberts, a Canadian session vocalist. 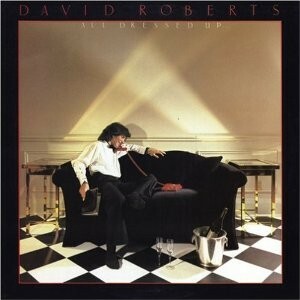 'All Dressed Up' was his debut album, released on the Elektra label in 1982. Roberts had journeyed to Los Angeles to find a producer who shared the same vision, and was also willing to commit to an unknown artist. The man enlisted was multi-talented keyboard player and up-and-coming producer Greg Mathieson, who had valuable connections to some of the best session players around at the time. There were fewer better than the likes of Toto members Steve Lukather (guitars), Jeff Porcaro (Drums) and Mike Porcaro (bass), who had enjoyed a lot of success with their first three albums, but were still not the megastars that they would become. It's worth noting that while the recording of 'All Dressed Up' was taking place in the day, Lukather and the Porcaro's were also working on what would become the 'Toto IV' album by night, which would go on to turn the band into household names and win them several Grammy awards along the way. It's a shame that the same rewards didn't come David Roberts' way with this album as it's a fine representation of the Westcoast scene at the time, full of great performances, a great collection of songs, and David's melodic easy-on-the-ear vocal style. 'All In The Name Of Love' kicks thing off, an upbeat pop-rock anthem with a catchy chorus with Steve Lukather's chugging guitar driving the track along. It's followed by the smooth pop of the mid-tempo 'Too Good To Last', complete with another big chorus. Although Roberts wrote and arranged all of the tracks, there's a big Toto feel to a few of them, such as the classy 'Never Let You Go' and 'Wrong Side Of The Tracks', and when you hear the staccato piano of 'Someone Like You' you will immediately think of 'Hold The Line'! The likes of 'Boys Of Autumn' and 'Anywhere You Run To' have a bit of a Christopher Cross / Hall & Oates feel due to the gentler nature of the songs, but the pop-rock of the slightly cheesy but infuriatingly catchy 'That's My Girl (She's Still Mine)' reminds me of The Cars 'My Best Friend's Girl', and it's this track that at the moment has me continually hitting the repeat button – great guitar work from Mr. Lukather too! It's only the jazz-tinged 'Midnight Rendezvous' that I think lets the album down – it's not a bad song by any means, but the keyboard sound and sax solo remind you how old the album is, it's just a little too 'Midnight Club' for me. The closing 'Another World' follows a similar path, but being predominantly piano and string-led stops it sounding too dated.